Superstar Rajinikanth and Shankar fans are awaiting for couple of years of the sequel of Robo and finally the wait is over. 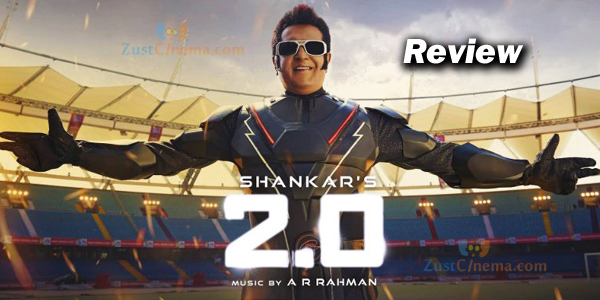 2.0 film has released worldwide in record screens and Zustcinema here gives review of Rajinikanth's 2.0 movie. Rajinikanth, Akshay Kumar, Amy Jackson are seen as main lead stars in the movie. First and foremost to give a bowing head to Rajnikanth for keep his blood and soul at this age too. He is seen in three different characters and his variations are commendable. Amy Jackson does a tough role till date as she has to behave as a humanoid Robot and does it very well. She is best fit as a robo. Akshay Kumar should be appreciated as this role is a physically challenging one to him as he has taken of time for prosthetic makeup and carry it. He is superb in his character. Other stars are perfect to the roles and does their best. Shankar's creative is amazing and his visual treat in a 3D is just awesome all the way. Srinivas Mohan's VFX supervision is superb and visionary. Nirav Shah's cinematography is top-notch and showing entire screen in colours is his brilliance. Indian Cinema has been taken to next level with Climax portion VFX and its design which are to elevated to higher standards. Editing is good and Dubbing part is clear. Dialogues are nice and AR Rehman's songs and BGM should be complimented. Cinema lovers will have a comforable 3D visual granduer in theaters only. One word can be said about the film is that 2.O is an Spectacular Visual Extravaganza and a wonderful feast to Indian Cinema Lovers. This visual granduer has a social message on how radiation of mobile towers is harming birds and in turn how they are effecting ecological imbalance which is thought provoking. 2.O is an Technological Excellence which should be watched only in theaters that too in 3D format.. Message from the movie - The World is not only for humans!